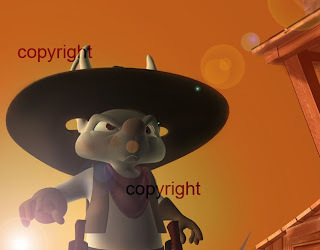 For anybody interested I have started up a new blog designed to document the making of my animated short film and introduce the main character. Just click the title of this post to be taken there. Hope to see you there. In recognition of his strong appeal for kindness to animals in his film, "Bambi" Walt Disney was given one of the few gold medals ever awarded by the American Humane Association for the Promotion of Kindness to Animals. Joan Bennett is shown making the award on behalf of the association. 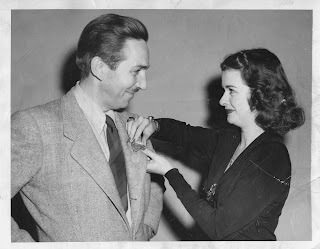 I e-mailed this photo to Walt's daughter Diane, she noted that "Joan Bennet was married at that time, I believe, to dad's good friend Walter Wanger." Joan Bennet by the way was a well known actress at the time and Walter Wanger an independant producer the classic "Stagecoach" being one of many productions he produced.